The HydroSpreader™ Sub-Surface Feeder is designed as a complete self-contained subsurface feeding system for direct placement on any suitable sized floating structure, barge or vessel deck. Designed with a low center of gravity, and available with a split hopper, the bulk bag loaded HydroSpreader™ will accommodate the dispensing of two different pellet sizes. IAS offers two feed-entrainment methods to rapidly move a specifically proportioned feed/water slurry mixture from the feed storage hopper down through submerged feed delivery hoses to any practical depth required for the subsurface feeding of caged fish. The entire process is calculated to minimize feed/water residence time in the entrainment and pumping process and through the process of moving feed through the delivery system with the end goal being full feed pellet integrity in the submerged cage for optimum feed conversion rates. The marine grade aluminum hopper is part of the design process taken to best manage equipment weight, load capacities, and center of gravity considerations for safe vessel operation. The positioning of safety grates at the feed hopper outlet and the incorporation of a bulk bag support frame positioned over the hopper lids reduce the chance of operator injury during loading. A large two-panel hopper lid design offers a large opening for easy bulk feed bag loading in all weather with the inner split hopper bulkhead reducing the opportunity for loaded feed to shift in poor site operating conditions. The HydroSpreader™ Sub-Surface Feder may be operated with a self-contained gas or diesel drive assembly or connected to a suitably sized on-board hydraulic power plant using two quick connect hydraulic hose couplers. This power is used to operate both a feeder mounted self-priming pump as well as the feed hopper’s feed metering system. In either self-contained or quick-connect hydraulic configurations the HydroSpreader™ is designed to be crane lifted on and off the feed vessel to quickly free up deck space when required. Feed dispensing is managed from a 12 volt DC powered FeedMaster™ Controller, a simple to access control interface used to monitor the operations of either a center-less auger or rotary valve assembly. Metered feed is introduced into a medium pressure water flow and pushed to depth through an operator selected feed delivery hose directed to each underwater cage. 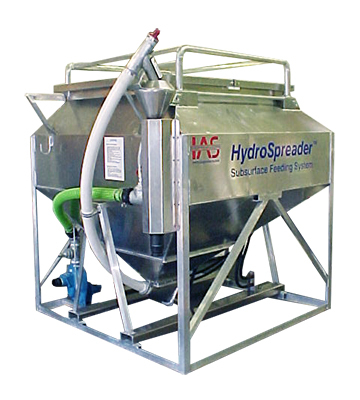 Hydraulic pump speed and rotary valve/auger speed controls are conveniently mounted to the side of the HydroSpreader™ along with the easy to program FeedMaster™ Controller. For permanent feeder installations these mechanical control and PLC feed management systems may be remotely mounted on a command bridge beside SeeMate™ Underwater Feed Monitoring Cameras that provide real time feed delivery and fish monitoring information during feeder operation. Marine grade aluminum hopper, stainless steel pump will not rust. Component design and equipment options allow for a range of operating configurations to suit client applications. Hydraulically operated water pump and auger minimize maintenance. Mix and blend two feed pellet sizes as required. Accurate feed metering and delivery rates. Rapid site setup and feeding operation. Low-loading height increases operating safety and open water stability. PLC offers real time control of feed rate, volume pumped, cage and daily accumulated feed totals. Adaptable to various platforms maximizes product life cycle versatility. Optional 4000 kg. and 5000kg. sizes available. Custom hopper sizes are available. Hoper may be split into two seperate chambers. 1 to 45 kg (100 lb.) maximum per minute of 11 mm feed pellets using ChoreTime® HMC model 90 center-less auger. Dependant upon physical site requirements. Focus is on minimum pellet/water residence time while taking into account the distance to travel, the pump’s flow rate, and the pump’s operating pressure for application. Marine grade aluminum, galvanized steel, stainless steel hardware, HDPE plastic.